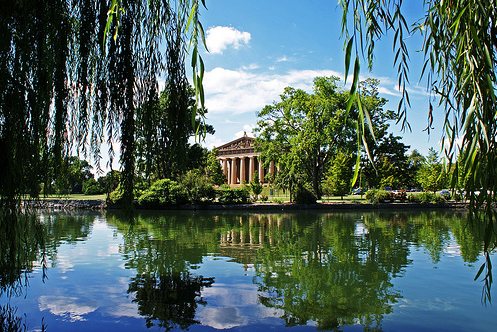 Last Friday I went for an early morning run at Centennial Park in Nashville. I was attending a three-day meeting sponsored by the General Board of Higher Education and Ministry to brainstorm ideas around the implementation of the new eight-year assessment of clergy that was approved by the 2016 General Conference. It was a glorious morning, and I planned to run four laps around a one-mile loop through the park. After mile three, I decided to change it up by going in the opposite direction. There was just one problem. I was enjoying wasting time with Jesus and anticipating how God would speak to me that day, but I wasn’t paying attention to anything else! Ten minutes later, I realized that I had veered from the marked trail. I had no idea where I was in the complex of paths that crisscrossed the park. After five minutes of running aimlessly and trying to find my way, I finally pulled out my phone and googled directions back to the hotel. This week, hundreds of United Methodist clergy all over the United States are moving and settling into new homes and communities, anticipating a July 1 start date in their new ministry setting. As with any job, getting off to the right start is essential for pastors and congregations. Just as the failure to pay attention to my surroundings when running in a different direction got me lost, so clergy must be intentional and strategic in their first ninety days in order to flourish in their new ministry. In Iowa, our appointive cabinet desires to increase the number of missionally effective appointments in order to fulfill our conference vision to be God’s hope for the world made real through faithful leadership, fruitful communities, and fire-filled people. One way in which we are doing that is by requiring all clergy moving to new appointments and all Staff/Pastor Parish Relations Committees who are receiving new clergy to participate in an Expectations Workshop. In addition, district superintendents will meet again with clergy and SPRC Committees three to four months into a new appointment to evaluate how those expectations are being lived out. In our work last week on the eight-year assessment, we heard a report from Matt Bloom, Principle Investigator, and writer for the Flourishing in Ministry Project; Emerging Research Insights on the Well-Being of Pastors. The 2013 project, which is ongoing, is sponsored by the Mendoza College of Business at the University of Notre Dame. According to Bloom’s research, flourishing in ministry, as well as in most professions, means to experience well-being, which consists of everyday happiness, resilience, self-integrity, and thriving. Everyday happiness measures the extent to which you and I experience positive emotions during the course of a day. By contrast, unhappiness can be viewed as the presence of negative moods and emotions. The average working adult in the US experiences a “modestly happy” morning until the commute to work, when there is a dip. There is a spike in happiness at lunch and again when the work day is over. The clergy everyday happiness profile is slightly different because of a fluid and often unpredictable schedule and many night meetings. Bloom and his team’s research into young clergy in their first seven years also shows that there are higher highs and lower lows for clergy compared to other professions. In general, sustained everyday happiness results in more positive than negative days and is associated with better physical health: i.e. stronger immune systems and cardiovascular systems and better stress responses. We also perform better and are more creative. How can church leaders work together with clergy to manage their schedules at the start of their ministry in order to maximize their everyday happiness? Resilience is the ability to adapt and grow in our capacity for spiritual vitality and skill development. Our brains are hard-wired for self-awareness, reflection, and self-control. However, many clergy tend to live outside our bodies and do not listen to the signals that our bodies give us to slow down, relax, sleep, or call it a day. When our self-regulating capacity declines, burnout builds over time. Burnout implies physical, emotional, and/or mental exhaustion, reduced adaptability and competency, and apathy, depression, or cynicism. Resilience can be especially elusive for clergy because of our tendency to think we cannot be truly happy as long as there is suffering in the world. How can we take time for our own well-being when there are so many people to serve? Interviews of seven thousand clergy of different denominations through the Flourishing in Ministry Project indicate that 40% are experiencing some level of flourishing. However, at any one time, 25-33% of clergy are suffering from high or severe burnout. How can clergy form new patterns and habits that foster health and well-being, especially at the beginning of new appointments? The Flourishing in Ministry Project shows that a clear sense of call and identity contributes to the well-being of clergy. Clergy who are comfortable in their own skin and pastor out of a deep sense of inner wholeness tend to flourish more than clergy who continually question their call because of a lack of confidence or continual conflict. Clergy are most able to be authentic and self-integrated when their skills, values, beliefs, and passions align with their context and they are affirmed in their particular ministry setting. By contrast, clergy who are not fully welcomed into a new congregation or are not able to fulfill the unwritten and unexpressed expectations of laity become more easily estranged from their own call. How can clergy and church leaders intentionally work together to build relationships, create trust, and provide opportunities for congregations to get to know their pastoral leaders in the first three months? Clergy tend to thrive in their ministry settings when they feel connected with their congregation in meaningful ways. The Flourishing in Ministry Project indicates that clergy have the highest well-being when they are accepted, affirmed, and cared for by their congregation. Despite common perception, clergy are more effective when they have a close friend(s) in the congregation who can provide rich feedback and informal mentoring and with whom they are able to be vulnerable. On the other hand, clergy often feel like outsiders and are isolated when they are not made to feel part of the community. In addition, clergy thrive when they are able to express deep convictions and passions in a sensitive and non-threatening way, even when not all parishioners might agree with them. When receiving a new pastor, can church members embrace the fullness of their pastor’s being, including the pastor’s need for friendship as well as becoming involved in ministries that feed their soul? O God, during this time when clergy are beginning new ministries in local congregations, may you surround both clergy and laity with a sense of anticipation, hope, and grace. I pray that all clergy will pay special attention to how they can get off to good start, which includes tending to their physical, spiritual, emotional, and relational well-being. P.S. I will be on vacation on July 2 and 9. The next Leading From the Heart will be published on July 16. Maybe some day you can share your thoughts on “Happiness or Joy”? This treatise today helped me to ponder the differences (of happiness and joy) and how meaningful they can be in our lives. Thanks for sharing the clergy well being components. Providing development support to clergy on these factors through coaching, assessments, and planning would be supportive. Your getting lost reminded me of 1984 in Germany when I did the same thing at 6 am. Lucky it was garbage day and people would direct me when I showed them my hotel key. Enjoy your vacation. I Had a good day yesterday in the Blue Water Ramble with a 100 mile bike ride. The 70 degree day may not be like the RAGBRAI. I look forward to our time together at RAGBRAI! Your comments about getting started on the right foot in a new congregation also translates to Christian Educators in new situations. Enjoy your vacation and the great outdoors.